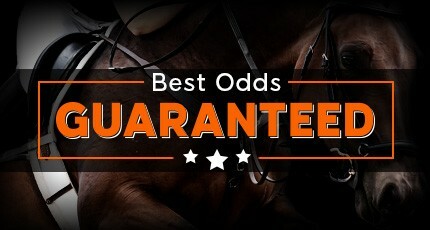 Unibet have Best Odds Guaranteed on UK & IRE Horse Racing! Place a bet on any UK or Irish horse race with Unibet and if you take a price and the SP returns a bigger price, they'll pay-out the bigger price. Offer applies to customers located in UK and Ireland only - maximum return of £25,000. Bet365 have Best Odds Guaranteed on Horse Racing! Place a racing bet with Bet365 on Horse Racing (any excluding Australasian) and if you take the price on your selection and the SP is bigger, they'll pay you out at the bigger odds. The offer includes Board Prices, Bet365 Early Prices, singles and multiples as well as Showcast bets. Australasian Racing, Ante-Post, Tote/Pari-Mutuel (bets and dividends), 'Not to Win', Enhanced Win, Cover Bets and In-Play bets are excluded from this promotion.